Electric car battery maker Ener1 says the filing will not shut down any of its operations, including a factory in Indiana the government helped finance with a $118.5 million grant. NEW YORK (CNNMoney) -- Electric car battery maker Ener1 filed for bankruptcy Thursday, three years after receiving a $118.5 million grant from the U.S. government. 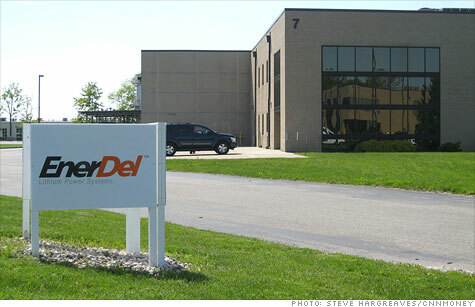 Ener1 (HEVV), which makes a variety of energy storage devices under different subsidiaries, is the parent company of EnerDel, the car battery division that received the government grant to help build a manufacturing plant in Indianapolis. Unlike bankrupt Solyndra, the advanced solar panel maker that became a lightning rod for critics of Obama's stimulus spending when it closed its factory and liquidated, Ener1 promised its business will proceed as usual. The company said the "voluntarily initiated" bankruptcy filing won't impact any of its subsidiaries, including EnerDel. "The restructuring will not adversely impact their employees, customers and suppliers," the company said in a press release, noting there will be no layoffs as a result of the action. The company blamed the bankruptcy on a slower than expected demand for electric vehicles. Analysts have also said any electric car battery maker faces stiff competition from Asian firms, which are largely considered to be well ahead of the curve due to their long experience making batteries for electronics. Ener1 was thought to offer one of the best chances for an American company to compete in this field. The company said that's still the case, and that the restructuring will allow it to reduce its debt and free up $81 million for capital spending. "Our business partners have an appreciation for our future business opportunities," CEO Alex Sorokin said in a statement. "We expect the new funding to provide ample liquidity for our subsidiaries to meet their ongoing obligations to employees, customers and suppliers." The Department of Energy, which awarded the grant, agreed. "While it's unfortunate that Ener1, the parent company, has entered a restructuring process, the new infusion of $80 million in private capital demonstrates that the technology has merit," DOE said in a statement. Ener1 received the grant in 2009 as part of a $2.4 billion stimulus effort to jump start the electric car industry. The program was different from the Energy Department program that funded now-bankrupt solar panel maker Solyndra and Beacon Power, a maker of energy storage devices. Nonetheless, critics jumped at the chance to highlight another government grant gone bad. "Sadly, the Department of Energy's jobs record seems to grow worse by the day," Florida Representative Cliff Stearns, a Republican, said in a statement. "It is American taxpayers who are paying the price." But during his State of the Union speech, President Obama struck a defiant tone, refusing to apologize for the decisions his administration has made, which includes the funding of hundreds of clean energy companies or companies engaged in clean technology research. "Some technologies don't pan out; some companies fail," said Obama. "But I will not walk away from the promise of clean energy."